Lady Israel, we salute you! Dear Lady Israel, Happy Birthday and may I just tell you just how fabulous you are looking at 64? You are aging gracefully and with dignity and are in no need of any botox injections to iron out your well-earned wrinkles. You are a tiny lady but boy can you pack a mighty punch! You have earned every wrinkle and grey hair. You have faced adversity over 64 years that have seen you shed many tears over the loss of your children. Those who bravely defend you in uniform on land, sea and air and those killed by virtue of the fact that they are YOUR children. This year we count 22 993 tears for those in uniform and 2 477 for Israel’s civilians which include foreign workers. You bring comfort to the mourners and hope to those who seek your protection. You stare down a formidable enemy who seeks your destruction and many who question your legitimacy. Lady Israel, as tiny as you are, you look them in the eye and state your truth. We salute you. It is a tragedy that would not be a misplaced plot line in Shakespearian literature. Roro’s Rantings is proud to present special featured guest, Olivier Rafowicz and his thoughts on the recent Toulouse massacre. This piece, recently featured on French radio, articulates beautifully what many people feel. What degree of hatred does it take to kill a child in cold blood? What degree of hatred does it take to kill children and then go play foot ball? What degree of hatred does it take to run in after a little girl into a school and shoot coolly? It requires a degree of hatred that exceeds the imagination of men who are normal but is taught and inculcated by some fundamentalist Islamic movements that increasingly extends its influence throughout the world. 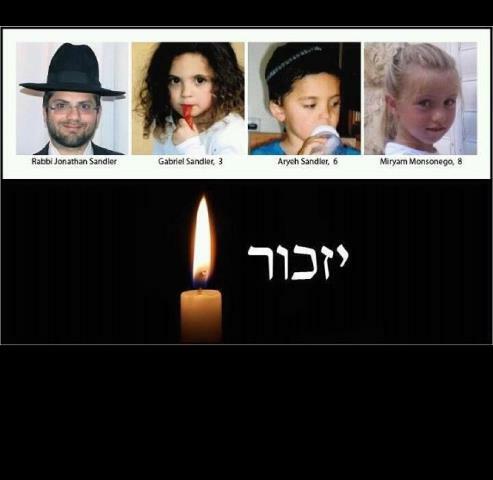 It’s been many years that Islamist terrorism strikes and kills and this week, we mark the 10 year anniversary when 30 Israelis were murdered on the evening of Passover in the Park Hotel, Netanya by a fundamentalist Islamic terrorist. We should erase the names of these terrorists from memory as these are not humans, and should not be mentioned in the company of their victims. They do not deserve their notoriety; instead we should always remember the names of their victims. What degree of hypocrisy does it take to ask why this creature of unspeakable terror committed this attack? What degree of anti-Semitism and hatred does it take to make the connection between children killed in cold blood and the Arab Israeli conflict on the same day? What degree of shame do journalists in need of material have to look for extenuating circumstances to explain this creature’s actions? Death, parental divorce, difficult economic integration has never made the Jewish immigrants from Morocco and Algeria Russia and Poland become assassins because they had problems integrating. You have to go over the current evidence. This killer was linked to radical Islamic terror groups. Each attack tells us that this is not Islam but the act of an isolated madman or someone who feels marginalised. How crazy that the marginalized hit and kill innocent Jewish children. After each gruesome murder, after the funerals are held, the local Imam speaks of unity and love. The Imams are aware of what is happening and should not act surprised while condemn the despicable act. Until the next time. There are often two languages, one for the press the other for the faithful. Dressed in suits and ties, these preachers of evil broadcast messages that are bought by the European pseudo-intellectuals and media who will hide behind the freedom of expression to try and understand the motivation behind the killer’s behaviour. This creates a buzz around the killer and we forget the names of the victims. They deserve to be remembered. We should ensure that there will be no more room for dangerous radicals who do not comprehend the difference between good and evil. It explains the inexplicable defends the indefensible we should no longer speak of the perpetrator and forget the dead. I propose that we remove the name of this killer, this creature of death from existence. No more mention of a killer who massacred children because they were Jewish. More recently over a million Muslims and anti-Israel activists attempted to march on Jerusalem. IDF and security forces were in a state of high alert to any kind of provocation. We recently witnessed Islamic fundamentalism in Toulouse and those who march on Israel did not endorse peace, they seek the destruction of Israel. Those who commit acts of terror in Israel seek its destruction. They threaten and sometimes success in killing. The only solution is vigilance and prevention initiatives.